In general when using an Arduino Pro Mini in one of our projects or products, we use an external LP2940CZ-5.0 voltage regulator instead of the on board regulator. This is because most things we make are for 12V battery systems, and the voltage from a 12V battery can get to well over 12V which is the specified upper input voltage for a Pro Mini. We have measured that one of these regulators with a 10uF capacitor across its 5.0V output, draws a quiescent current of only 0.079mA. 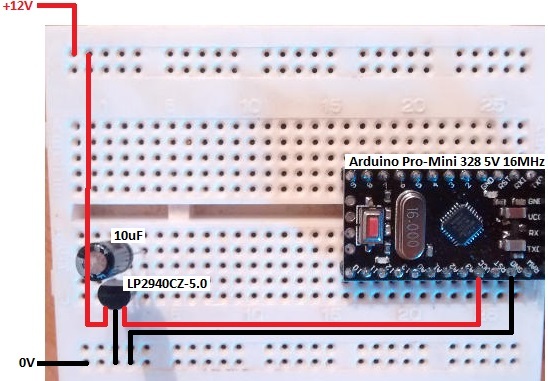 We have found that an Arduino Pro Mini, whether powered as described above, or with the on board regulator draws around 20mA @ 12.0V. This is very high for an always on battery powered device – it will use 500mAh (0.5Ah) of battery charge per day. Therefore, we are always interested in testing ways to minimise power consumption. We set up the above test circuit with a 12V input, and our usual LM2940CT-5.0 regulator connected to an Arduino Pro Mini (16MHz / 5V). With a sketch containing just delay(8000); in the loop() function – i.e. the Arduino will wait 8 seconds, then wait another 8 seconds, then wait another 8 seconds, etc – we measured a current draw of 19.793mA @ 12.0V input voltage. 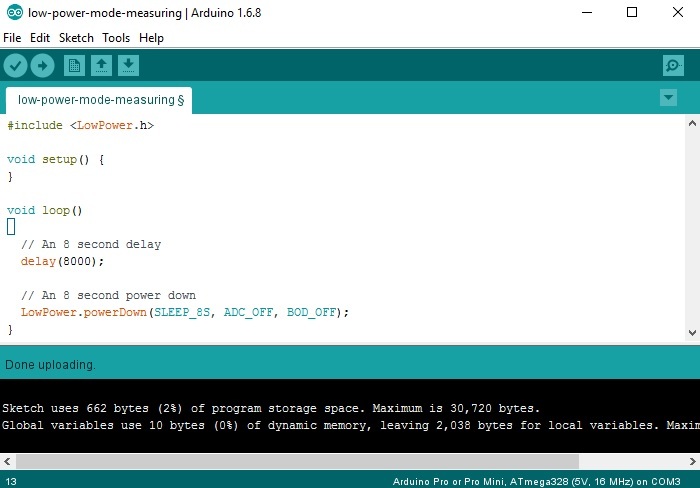 We downloaded and installed the following Lightweight low power library for Arduino – LowPower.h, and modified our test sketch as shown below to power down the microcontroller for 8 seconds within the loop. This time we measured the current draw to be just 6.265mA @ 12.0V input voltage – a huge reduction of around 70% power consumption obtainable just by replacing the delay function with the powerDown function from the LowPower library. We make a lot of dataloggers and monitoring devices which spend most of their time doing nothing – just waiting to take the next measurement. Therefore this low power library is a quick and easy way to reduce power consumption. 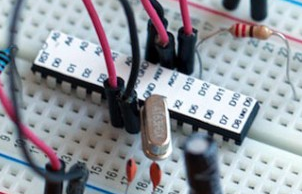 If you use a Standalone Arduino on a breadboard directly powered by a battery pack of the correct voltage (i.e. no voltage regulation required), it is possible to run your Arduino off less than 50uA @5V (<1000th the power consumption of our tests above) and therefore power something for years with a AA cells or smaller. See here for an excellent article How to Run An Arduino For Years on a Battery from the Open Home Automation website where they use the JeeLib low power library with a standalone Arduino.